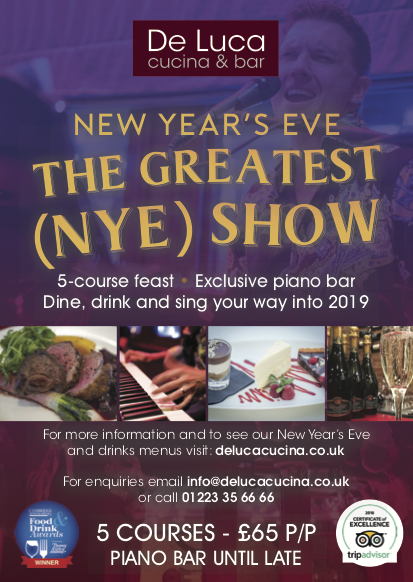 New Year’s Eve 2018 at De Luca – Ticket Only! For New Year’s Eve, De Luca Cucina builds on its offering from the rest of the year: serving fantastic food, hand-made onsite using fresh, locally-sourced ingredients. 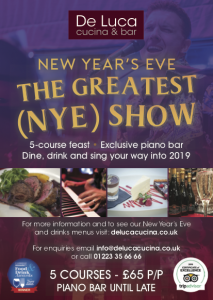 New Year’s Eve is a special night though and for 2018/19 De Luca is hosting a ticket-only celebration, which will include a sumptuous five-course menu and exclusive access to the award-winning top floor Piano Bar. Celebrations will really take off after dinner with Robin P-iano leading the requests and sing-along as midnight approaches and into the New Year. There is only a limited number of tickets available for this exclusive event, so early booking is highly recommended. The restaurant and Piano Bar will not be open to the public on New Year’s Eve. Tickets are £65 per person. Click here to see the New Year’s Eve Menu.